This is a luxury residence built by a young French architect retaining the traditional Marrakech riad concept located in the European sector near the Palmeraie within minutes drive of the Marrakech historic center, the medina, restaurants and cafes. 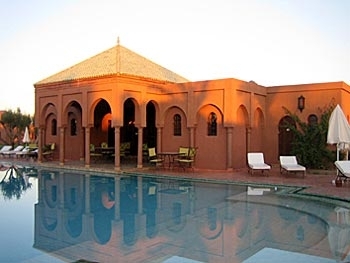 The residence is private and completely gated, made up of about 20 individual riads around a central area with a large 20 metre swimming pool and a beautiful bar with outside dining. It comes with the full services of a housekeeper who can cook your meals (including traditional moroccan), handle all domestic tasks and assist you during your stay. A private driver can also be arranged for the day/week to take you on your outings whether to the local 'souk' in the medina or to the Atlas mountains. There are 3 bedrooms, a large open plan living room (58m2) which was built out of traditional materials by expert craftsmen but with the benefits of modern comforts such as air-conditioning throughout.